Ankara expects eight partner countries of the F-35 military aircraft development project to fulfill their responsibilities, Turkey's minister of national defense said Wednesday. "As strategic partners, we continue to work on economy and security," Hulusi Akar told Anadolu Agency following a meeting with his U.S. counterpart Patrick Shanahan in Washington to discuss recent political and military developments. Akar said the U.S. has presented Turkey a new proposal on air and missile defense systems. The proposal is currently under examination by the relevant bodies and institutions. He noted that F-35 fighter jets are one of the issues that they discussed during the meeting. "As a partner of this project, we have completely fulfilled all our responsibilities," Akar said, adding that Ankara expects eight other partner countries to fulfill their responsibilities toward Turkey. Turkey decided in 2017 to purchase the S-400 system following protracted efforts to purchase air defense systems from the U.S. with no success, and the first S-400 is likely to be delivered in June. Apart from Turkey, Australia, Canada, Denmark, Italy, the Netherlands, the U.K. and Norway also participate in the multinational F-35 stealth fighter projects. The first two F-35 jets were delivered to Turkey in June 2018, and Turkish pilots started their training at the Luke Air Force Base in Arizona. Last week, Turkey received two more jets despite the outcry by U.S. senators. Currently, Turkish pilots continue their training and the jets will be deployed to Malatya air base in Turkey by November. Turkey's domestic industry has played a substantial role in the Joint Offensive Aircraft Project, and these participating firms are expected to make a profit of $12 billion. For instance, Alp Aviation helped produce bodywork and landing gear, while defense giant ASELSAN developed electronic optical targeting systems and air intervention controls. Ayesaş supplied the missile remote control interface and panoramic cockpit imaging system, and Fokker Elma produced electrical cabling and internal connection systems. Havelsan provided the training systems for F-35 jets, while Kale Aviation produced the body structure, connections and landing gear locking systems. Moreover, Turkey's proposal to form a committee to examine technical concerns about its procurement of an advanced Russian missile defense system is still under consideration, its presidential spokesman said Tuesday. "And our proposal to establish this technical committee under the NATO umbrella is still on the table. We are waiting to hear from our U.S. colleagues and from NATO," Presidential Spokesman Ibrahim Kalin told reporters at the Turkish Embassy. "Because we wouldn't want to have our F-35 program jeopardized in any way by the S-400 or any other system." In an interview with Anadolu Agency (AA) Tuesday, Kalın dismissed comments aimed at Turkey's membership in NATO amid a row with the U.S. over the purchase of a Russian missile defense system, asserting that Turkey will continue to take steps that will strengthen its position in the transatlantic alliance. Earlier this month, U.S. Vice President Mike Pence said Turkey's purchase of the S-400 system could potentially pose a risk to NATO. Kalın said it is not possible for Turkey to accept such statements, adding it is not a single country that will determine the status of a country in NATO but all NATO member countries. "Besides, we are not an observer [country] there. We are one of the members. We are a country that has a say in all decisions," he said. "Therefore, we will not allow the questioning of Turkey's position in NATO." In his remarks, he reiterated that Turkey's relationship with Russia was not an alternative to that of the U.S. or Europe. 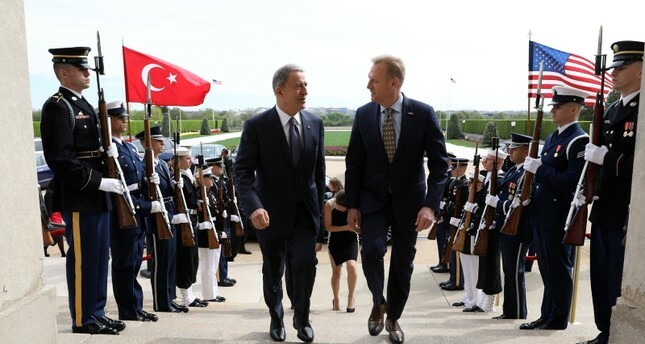 Minister Akar also noted that he discussed recent developments in the Eastern Mediterranean with Shanahan. "Some senator drafted a bill on the U.S. policy in the Eastern Mediterranean last week. We have conveyed to our American partners Turkey's concerns and opinions. We have underscored that the Turkish Cypriots also have a right to the resources in the region and their rights should not be disregarded," Akar said. Any policy design in relation to the Eastern Mediterranean must consider the fact that Turkish Cypriots also should be integrated into the process for an equitable share of resources, he added and emphasized that Turkey does not act contrary to this stance. A bipartisan bill was introduced last week by Republican Marc Rubio and Democrat Robert Menendez. The bill, "Eastern Mediterranean Security and Partnership Act," suggests that the arms embargo on the Greek Cypriot administration be lifted. While increasing military program funding and reintroducing Foreign Military Assistance for Greece, the bill also proposes the U.S. should align itself with Israel, Greece and the Greek Cypriot administration in the region by engaging in active energy diplomacy to utilize the discovered reserves. Friendship was reiterated Tuesday by the Turkish ambassador to the U.S. to describe Ankara's current relationship with Washington. Serdar Kılıç, who has served as ambassador to the U.S. since 2014, called on both nations to "defend, protect and further strengthen" ties. "We are friends and friendship needs care. We cannot take it lightly. Turkey needs the United States. But I can assure you that United States also needs Turkey," Kılıç said at a conference on American-Turkish relations in Washington. There are a number of issues currently facing the countries' relationship, including the U.S.'s support to the YPG/PKK terrorist group in northern Syria and the American response to Turkey's purchase of the Russian S-400 missile defense system. "Public speeches about imposing sanctions on Turkey, limiting the transfer of F-35s or excluding it from the JSF [Joint Strike Fighter] program, in which Turkey is a founding partner and a co-producer, not a customer by the way, is simply counterproductive," said Kılıç. "Turkey is ready to proceed with the purchase of Patriot missiles... if we can reach a satisfactory deal in the ongoing negotiations," he added and warned threatening language used by Congress will not help.